This hand held siren from Carson Sirens the most rugged and dependable siren on the market, is here and is making a huge hit with police, fire and EMS. The SC-1022 hand held police siren and fire siren is the lowest cost most featured packed siren out there. If you haven't heard the Carson Sirens mechanical tone yet, you are missing out! The Sc-1022 siren has this traffic clearing siren tone. The Sc-1022 volunteer siren is the best choice for volunteer firefighters period! 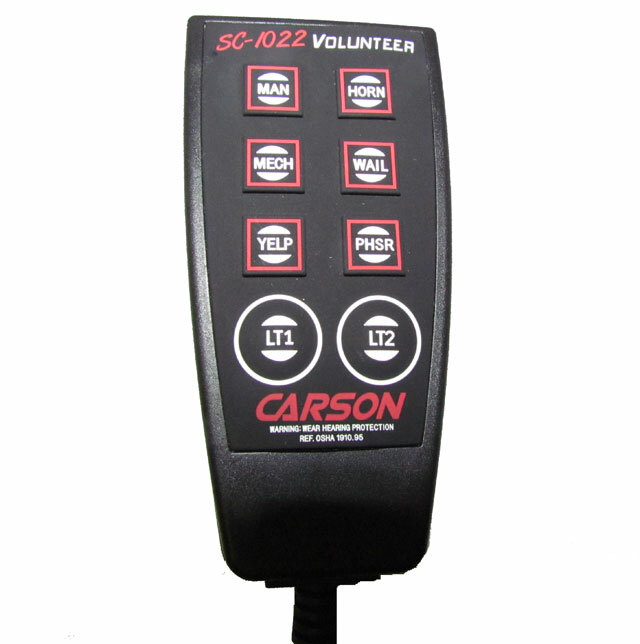 Carson SC-1022 Siren is a firefighter's best tool. Sirens in personal vehicles can be obstructive. Most personal vehicles are not designed for installation of emergency vehicle sirens. That's why the Carson SC-1022 Firefighter Siren is perfect for every volunteer firefighter out there who needs true warning power without the size of a console mounted siren. Another great feature of the siren is the handheld remote. During operation, you simply take the controller and control both your siren and lights. The push buttons are easy to feel without using taking your eyes off the road. This is a huge safety plus to begin with, but there is more! The other benefit is during installation. 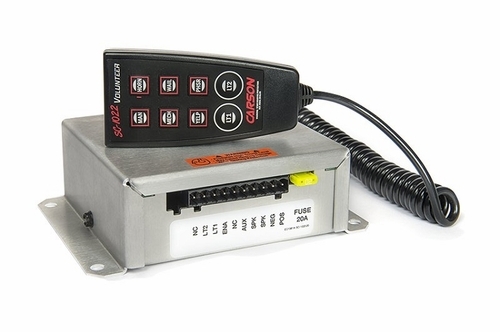 With the SC-1012, you have to not only wire the siren to the speaker and power, you wire the siren to the several switches that are on the switch panel. This adds sometimes hours to your install. (Depending on your skill level). With the SC-1022 mechanical siren, you simply plug the remote control into the amplifier box and you are done. For the price difference between the SC-1012 and the awesome SC-1022, this along is worth it! There are two parts to this siren. First, you have the actual amplifier itself. This is the size of a standard siren. This is what powers the siren speaker that you mount in your grill or in the hood compartment. This is a 100 watt siren amplifier that is the same volume and built with the same standards as your standard NFPA certified fire apparatus. The siren amplifier will mount underneath your passenger seat (most common), hidden well away from view. This way it is there when you need it - out of the way when you don't. The second part to the siren is the remote control. This connects to the amplifier via a coiled cable. It's simply plug and play. Once the controller is connected to the amplifier, you are able to control all functions of the SC-1022. You have 6 different buttons that operate different tones and 2 buttons that operate lighting. That's right! The Carson SC-1022 has 2 lighting circuits that can be controlled directly from the controller. So let's say that you have the SoundOff Intersector LED Light that clear intersections, a other LED lighting to the front, and SoundOff Undercover LED Inserts in the rear. You can have "lighting stages" set up to where you can activate only the front lighting, only the rear lighting or both for emergency response mode! Each circuit has 20 amps so that you can provide enough power to connect a full size LED lightbar as well. The controller is rubberized, backlit and changes colors when you have a specific function activated. The final aspect that the Carson SC-1022 Siren offers is it's sound. We all know what a fire truck sounds like. We operate them or hear them everyday. That sound is unique. Reproducing that sound is very difficult (especially since it's patented). But the Carson Sirens SC-1022 Volunteer Siren produces a mechanical siren sound that is just as effective as the classic sound! The SC-1022 includes your standard tones such as wail, yelp, phaser, stuttertone air horn, and the manual ramp up and ramp down, but also includes the best sounding mechanical siren tone that has ever been produced. The "rasp" of this tone is highly effective. We can attest - people will expect a full size engine and will give you the right of way quicker! We have tested this - it works! By far the best siren out there for the price. I bought one and it definitely moves traffic flawlessly. Wouldn't ask for anything better. Highly recommend this product! One of the best compact sirens on the market. I have had this for about 6 months and I love it. Purchased the slim speaker with it and it works like a champ. Only thing I would change is the wail. It would be nice to start at a higher frequency. But other then that the unit is GREAT! Was pondering which siren to get from carson but because of the much needed space issue i chose this unit. Great customer service and a great product. No issues during shipping and so far this siren is doing great! Siren has many of options and the light switches on the remote just make everything easier. Very loud also does have an odd horn but the mechanical tone makes up for it!!! I am thoroughly impressed with this siren! Big performance from such a small package. The mechanical tone is one of the best I have heard from an electronic unit. If your able purchase the holster for the hand held control unit you'll be glad you did. Carson truely made a great siren in this unit and The Public Safety Store is a great place to get it. Great deal all around! Will definately recomend this siren and The Public Safety Store to others....keep up the great work guys! This siren Installation was a breeze. I got the 84.99 speaker with it, its plenty loud. Havent had a chance to try it out yet. Hats off to the public safety store. I ordered it tuesday afternoon and by the evening it was shipped! Man thats awesome in todays world when nobody keeps any inventory. I got it friday at noon. Took almost 4 hrs to install. I didnt buy the wiring kit. I just went to autozone picked up everything i needed. I would recommend this to anyone. Fast shipping, Great Product.. Just got it installed today and this is a perfect system for anyone who owns a Jeep. The way we have ours installed is: the main unit under the driver's seat, the remote goes perfectly inside the hand rest box as the new re-designed Jeep Wranglers hand rest box has a factory space hole where you can run the cable and the entire system and remove is hidden from thiefs. We got ours installed with a 100 watt Siren Speaker right at the front Grill and it sounds loud as hell... Highly recommend this item for anyone who off-roads. In an emergency situation, this will be your NUMBER 1 call for help. Very good siren for the price. Easy install and the backlit controls are great at night . Excellent choice, well worth the money and by far the best sounding siren I've heard. Installation was a breeze and you just can't beat the price of this item. For a volunteer firefighter you must have this siren it's so nice to have everything right in your hand when you need it. This siren is amazing!! The small size is excellent and has an amazing sound. The remote is nice and small, super easy to use when your driving. Not only is the siren nice, but it is awesome having the perfect amount of light controls right in the palm of your hand. It is the perfect switch box/siren combo anyone could ask for. I've had tons of people tell me that they think the ladder truck or engine is coming down the street. Wouldn't think back on my decision for a second! I purchased this siren and the small profile speaker. I received the items in a timely manner, however the documentation for the SC-0122 was not in the box. I had to print the instructiions off Carson's website. Installation went well with no big surprises. I did have a question regarding max start up amps of the light circuit, but the documentation did show me what I needed to know. If you do use this siren make sure you have enough slack in your wiring so when you install it into the wiring block you have enough room to manipulate it to hook it up to the back of the unit. For use, the handheld remote is great, just have to get used to which button is what when your responding so you don't take your eyes off the road. Siren sounds are good, but I wish the wail would start a little higher in frequency.